Based in the USA with clients around the world, Ultrasonics World offers low-cost high-power ultrasonic products. Here we showcase a range of top-quality replacement components at super-low prices. These parts are fully compatible with the standard components from major manufacturers including Branson, Telsonic, Sonics and Materials, Misonix, Dukane. We're able to sell these ultrasonic parts at rock-bottom prices only because this is an automated operation with minimal overheads; we don't offer help in selecting suitable parts for a particular application, rather, you are expected to know what you want and be able to specify it exactly. Generally this means that you already have ultrasonic equipment working and need replacement parts for spares or to replace worn or damaged items. Likewise if you need further information about these parts please see the other manufacturers' sites linked above. Remember, our components are fully compatible with these major manufacturers and constructed to equal (in many cases slightly improved) quality. If you have a new application and need help specifying suitable equipment to use, including custom equipment designed and built specially for you, please visit our partner web-site MPI Ultrasonics for more information. 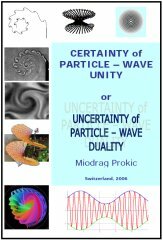 Innovative aspects of particle-wave duality, gravitation and electromagnetic theory addressed from the point of view of electric and mechanical analogies (free download).